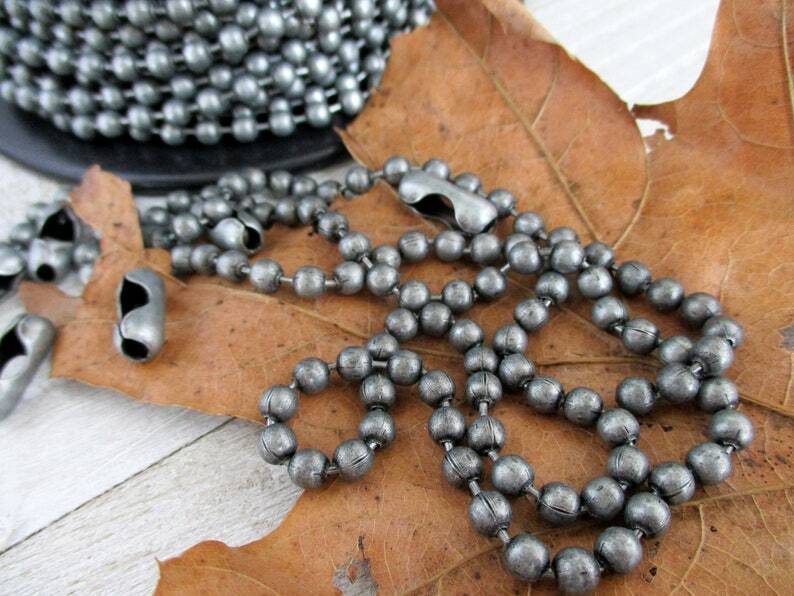 A great new finish on this Ball Chain by the foot. It is an antiqued grey, not quite as dark as gunmetal. The base metal is carbon steel with a bonded epoxy finish. Look at the second pic for comparison to aluminum. The balls are 4.8mm diameter and there are approximately 49 balls per foot. This is bulk chain and one connector is included with each foot of chain purchased. Dungeon looks great with antique silver, pewter and black, and also mixing with copper. This chain is made in the USA and meets all quality standards. You choose the length you need and 1 connector is included with each foot (or partial foot for the by-the-inch choices). If you need additional connectors just let me know in the comments box. COPPER BALL CHAIN, 3.2mm Bright Copper NeW SiZe Connector with each Foot of Chain, 2 ft to 20 ft Bulk Chain, Ready to Ship!